Ben Griset (BT '12) threw a shutout with 12 k's. 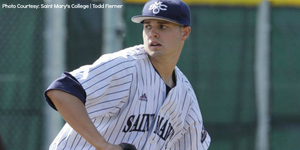 Ben Griset (BT '12) came up big for St. Mary's (CA) last Saturday. Throwing 130 pitches (97 for strikes), Griset pitched a five-hit shutout against Utah Valley State. Griset showed tremendous control over nine innings of work during which he struck out 12 and walked just one batter. On the other side of the country, Kevin Tatum (BT '13) had this week's best game by a Big Train hitter. Tatum led Cornell to a 10-9 win over Davidson on Tuesday night as he drove in runs both loudly and quietly. Tatum had two home runs and two sacrifice flies to drive in five of Cornell's runs. The best overall week belonged to Michael Bass (BT '11-'12 / UNC-Wilmington) once again. Bass had an incredible .650 on-base percentage for the week (eight hits, four walks, and a hit-by-pitch over 20 at bats) and made the most of his time on the bases by stealing four more bags. He also scored six times, drove in four, and smacked a double. San Diego State benefited greatly from a bunch of Big Train players this week. Tyler France (BT '13) helped out at the plate (6/16, 3HBP, 2R, 6RBI, HR) but the majority of the help came in the mound. Four Big Train pitchers -- both past (Ryan Doran, BT '12 and Ethan Miller, BT '12) and future (Justin Hepner, BT '13 and Bubba Derby, BT '13) -- combined for a great line for the week. They picked up two wins in 15 innings from the mound allowing four runs on 17 hits, six walks, and one hit-by-pitch while striking out 14. Other notable hitting performances: Hunter Renfroe (BT '11-'12 / Mississippi State) - 5/16, 4BB, 4R, 7RBI, HR, 2 2B, 3SB... Tucker Tobin (BT '11-'13 / George Mason) - 5/13, 2HBP, 3R, 2RBI, 2B... Justin McCullough (BT '10-'12 / El Camino CC) - 4/12, 3BB, R, 4RBI... Landon Appling (BT '11 / Houston) - 3/13, 2BB, 2HBP, 3R, 2RBI, 3B, SB. Other notable pitching performances: Trevor Charpie (BT '13 / Tennessee) - 6IP, W, 0ER, 5H, 2BB, 2K... Jimmy Reed (BT '10 / Maryland) - 8IP, W, 2ER, 5H, 3BB, 3HBP, K... Danny Mooney (BT '13 / Davidson) - 7IP, W, 2ER, 8H, 3BB, 2HBP, 5K... Ian Gilbaut (BT '13 / Tulane) - 5IP, SV, 0ER, 2H, 0BB, 6K.